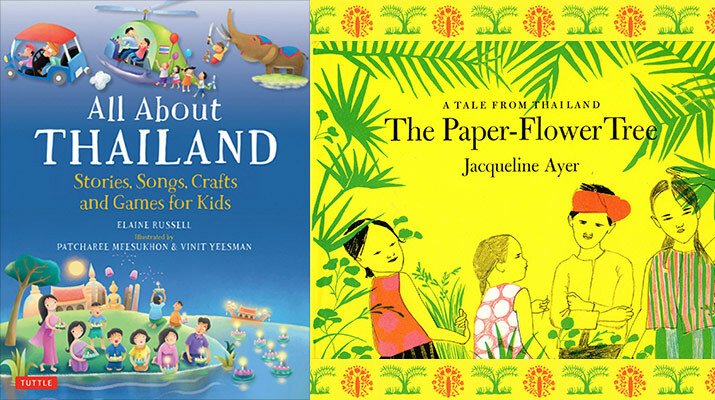 Here’s new and some favorite children’s books about Thailand – to read before a family trip, read at home, or wherever you curl up with fun books. Stories about Thailand – elephants, umbrellas, kites, tigers, Buddhist monks, a magic paper-flower tree, and non-fiction books about Thailand and Bangkok today. All About Thailand by Elaine Russell, Patcharee Meesukhon. The Paper-Flower Tree by Jacqueline Ayer. Note: Jacqueline Ayer, author and illustrator, lived in Thailand for years, and created picture books for her daughters. Nu Dang and His Kite by Jacqueline Ayer. Tua and the Elephant by R.P. Harris, Taeeun Yoo. B is for Bangkok by Janet brown, Likit Q Kittisakdinan. The Umbrella Queen by Shirin Bridges. Buddhism in Thailand by Frances Hawker, Sunantha Phusomsai, Bruce Campbell.